!! Flexible booking period - book for only two days, even in high season !! Wherever you stay in this resort, you can hear the roar of the sea because the huts and the North Sea are separated only by the dunes. 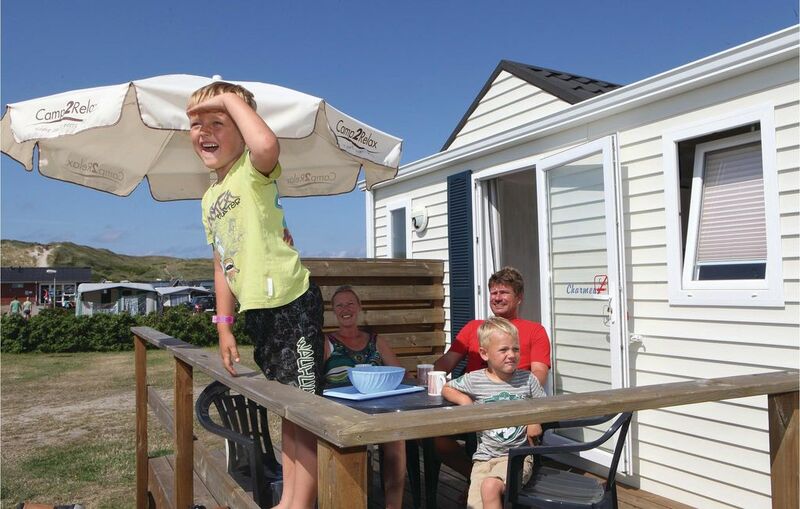 From here, you have an incredible view of the long, white sandy beaches and the North Sea on one side and the Ringkøbing Fjord on the other. There are free activities all day long, especially for children. Thus, they can form friendships during their stay, that last even afterwards. This well-equipped camping area offers good opportunities for surfing, biking and swimming in the sea. You can also enjoy swimming free of cost in the pleasant covered water park. The 1000 m² pool area also has a slide, a sauna, a steam room and a jacuzzi - so do not forget to bring your swimsuit. At Dan Camps you will find virtually everything you need on your holiday. There are shops that offer freshly baked bread, newspapers, food, laundry, rental of bedding, high chairs and beds. In the service building there are facilities for bathing your dogs, filleting fish and freezers to store your catch. There are also natural playgrounds and many activities for children. Just 6 km to the north, you will find the cosy, authentic fishing village of Hvide Sande, situated between the sea and the fjord. Here you can explore the cosy harbour and of course taste fresh fish. You can also catch your own fish here or buy some. In summer, fish auctions are organised, specifically for visitors. This is the right place for a holiday with the family. The size of the house pales in comparison to the spectacular nature, the beach, the sea and the entertainment facilities right at your doorstep.